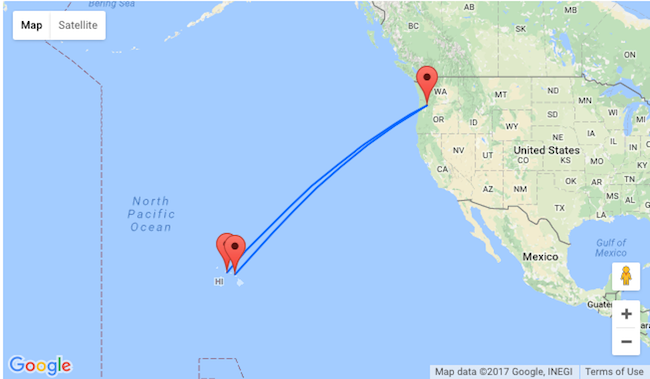 Portland to Hawaii for only $346! Don’t pass up a nice chance to relax on the fabulous Hawaiian beaches! Take advantage of the low fares on this United Airlines flights from Portland to Honolulu or Kahului for only $346 round trip! Honolulu, located on the island of Oahu, is the perfect place to relax during the day and party when the sun goes down. The clear blue waters of Kailua Beach, the famous Waikiki, the historic architecture of Iolani Palace and the timeless memorials of Pearl Harbor – you’ll find it all on Oahu. Maui consistently lands atop travel-magazine reader polls as one of the world’s best, most romantic islands. Why? Most start with its wealth of glorious beaches and go from there: luxe resorts, friendly B&Bs, gourmet cuisine, fantastic luau, and world-class windsurfing, whale watching, snorkeling, diving and hiking. Need adventure? Drive the jungly road to Hana or traverse the moonlike volcanic crater of Haleakala. Want pampering? West Maui awaits your call. Need more? Maui is the gateway to its sister islands of Moloka’i and Lana’i, which are conveniently reached by ferry. But is Maui really all that? Well, it does weave a gauzy spell that leaves most visitors more in love than when they arrived, so you’ll just have to excuse those who, when the magazines call, wax a little enthusiastic. In Honolulu recommend you to book Aqua Aloha Surf Waikiki with a good price and good reviews. NYE: Cheap non-stop flights from New York to Madrid or Barcelona, Spain from $273!